Hillary Clinton's moving speech cemented a place for herself and the feminist movement in the unfolding drama of the 2008 presidential election. AP Images Sen. Hillary Clinton speaks to supporters at the National Building Museum in Washington June 7, 2008. Hillary Clinton’s moving and brilliant speech today cemented an independent place for herself and feminists in general in the unfolding historical drama of the 2008 presidential election. The speech, which situated her more firmly than ever in women’s history, provided a powerful endorsement for Barack Obama, while at the same time reinforcing her position as virtually his equal in the Democratic primary race. Clinton essentially empowered her audience by implying that they, more than anyone, could make the historic difference by electing an African-American President on the rising tide of the women’s vote. 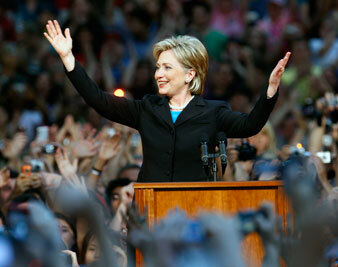 She assured them that the two candidacies had shattered all gender and racial barriers to democracy’s highest office. Hers was not the surrender pose traditionally expected of “losers” but a redefinition of what winning ultimately means. It suggested that she will be treated as a full partner in the process, and it was a victory speech for the power of social movements. She bravely rejected the bitter destructiveness that gnaws within all campaigns that lose closely, and held the high ground. Characterizing her decision as a “suspension,” however, still left open the prospect of hard bargaining with Obama over a range of issues, but apparently in a greater atmosphere of unity. One wonders if she would be the nominee if she had pursued the tone of today’s speech more and the advice of her (male) advisers less. It took a year, and a string of campaign disasters, before she threw out Mark Penn, though still leaving in place a cast of male operatives like Lanny Davis, who only blighted her image as an experienced, pragmatic representative of the sixties student, antiwar and women’s movements. Her 2002 vote to authorize the Iraq War, which opened the door for Obama’s candidacy, was advised as the way to prove that a woman could be Commander in Chief. So were her later comments about obliterating Iran. Her male advisers incessantly pressured the media to play up the Rev. Jeremiah Wright and Bill Ayers, race-baiting and red-baiting positions she never would have adopted in the late sixties. This wasn’t a problem unique to Clinton alone, of course. If Bill Clinton had not promoted NAFTA and the WTO, there would have been no space for Ralph Nader to run in 2000. Had John Kerry followed his 1970 antiwar, anti-establishment instincts in 2004, he probably would have been President today. The Democratic Party consultant class has been counseling retreat from the sixties ever since… the sixties. It has been a risk for Obama’s centrist campaign as well, although his 2002 antiwar stance and the unified enthusiasm of the black community position him firmly within a progressive history. This basic identity confusion at the center of the Clinton strategy was the crucial reason, next to Obama’s superlative campaign, for her narrow defeat. The irony is that her resurrection can now begin.